We offer a total background music solution (hardware/software and a music library), or just software (which you can put your own music on). Our system is suitable for shops, restaurants, hotels, bars, health clubs and more. Play the background music from a Player or PC located in your premises, or stream your music via the internet (like your own radio station) from our channel streaming servers. Basic Streaming: Live streaming based (Single Channel). From £2.99/week, plus player device. You choose a single music channel from our selection. This stream is delivered live, via the internet, to a small player device (not much bigger than a pack of butter) or to your PC computer or laptop. More Choice Streaming: (5 channel selection). From £8.99/week, plus player device. You choose up to 5 music channels from our selection. 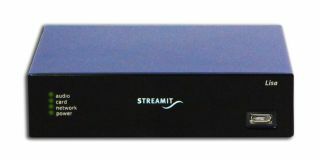 These streams are delivered live, via the internet to the advanced player device which allows you to choose between the 5 channels (or to your PC computer/laptop). Streaming Options require a good broadband internet connection. BMS Software Options are the most flexible packages we offer.